Google Chrome has added “Chrome Apps Launcher” feature to open, remove and manage Chrome apps more easily. Besides usual apps and extension – now there are new type of Chrome apps that work outside Google Chrome browser. It means, you do not need to open Chrome browser to use these “for your desktop” apps and they can be launched directly from Chrome Apps Launcher window. 1. If you are using latest version of Google Chrome browser, goto Start and type “Chrome App Launcher” in search box to open it directly. Right click on the apps launcher icon on the taskbar to pin it on the taskbar itself for quick direct access. 2. If you still do not see Chrome Apps Launcher, update Google Chrome browser by clicking icon at upper right and then “About Google Chrome” option to start auto update download. 3. You can try and get feel of opening and using apps outside Google Chrome browser by installing apps that work outside browser. For this, open Chrome Web Store and goto Collections > For your desktop option on left sidebar. Install any of these apps and click on installed app icon on the Chrome App Launcher window. This will open that app directly in full screen mode (without Google Chrome opening in the background). 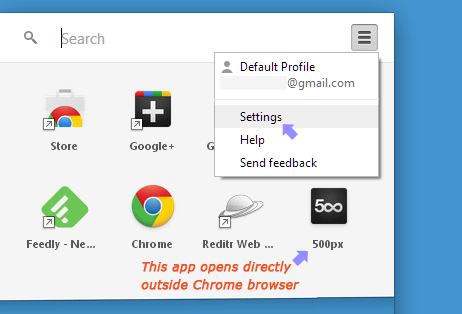 Since Chrome App Launcher is integrated in Google Chrome browser, you can not delete this feature. However, you do have option to hide Chrome App Launcher from the taskbar. Just right click on the app launcher button on the taskbar and click unpin option. 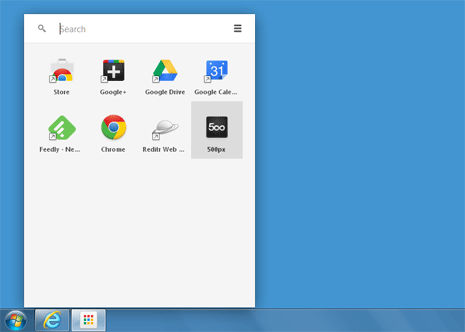 Unfortunately, there is no working solution to completely remove or disable Chrome Apps Launcher on Windows PC. 1. If you have installed lot of apps, then no need to waste time in finding icon of specific app – use search box at upper left. It will quickly show specific app icon for quick launch. 2. You can arrange and organize icons as per your choice through easy drag drop routine. Just drag icons to position and organize them in most preferred layout as per your comfort. 3. There is setting option at upper right to select which specific items you want to sync with your current Google account login. Some buttons in Chrome App Launcher have arrow. These identify apps that open in new tab window of Google Chrome browser. App button with no arrow open outside Chrome browse and work independently.